Dr. Sylka Sanchez, Legal Director of Noboa Corporation, assured in a statement published today by Diario Expreso, that the prohibition of leaving the country issued against Alvaro Noboa, is loosing validity, referring to the situation between the SRI and Exportadora Bananera Noboa S.A.
She refers to the Exception Lawsuit placed by the company which has to be sent today to the Tax Court by the SRI, to be taken in as mandatory. 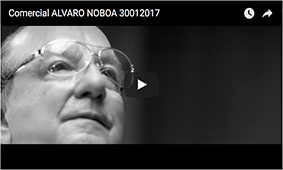 “Only a Judge can forbid Alvaro Noboa, or any ecuadorian, to leave the country” pointed out Dr. Sanchez. A new chapter begins with this Exception Lawsuit, because Exportadora Bananera Noboa’s case is now in the hands of the judges , and the SRI has no longer jurisdiction over it so it cannot issue any measures against the company. Alvaro Noboa, who was in Miami when the SRI seized the company assets, and illegally forbade him from leaving the country, has assured publicly that he will return to Ecuador to register his presidential candidacy.